I'm not ashamed to admit that I bought the Rituals Honey Touch Rich & Nourishing Body Cream because Fleur De Force raved about it. I've watched so many of her videos where she mentions how much she adores the Laura Mercier Souffle Body Cream but at over £40 I would definitely have to work myself up into buying something like that. Then she showed the Rituals Honey Touch Rich & Nourishing Body Cream in a video saying that she feels like it's equal in many ways to the Laura Mercier version, I was sold. 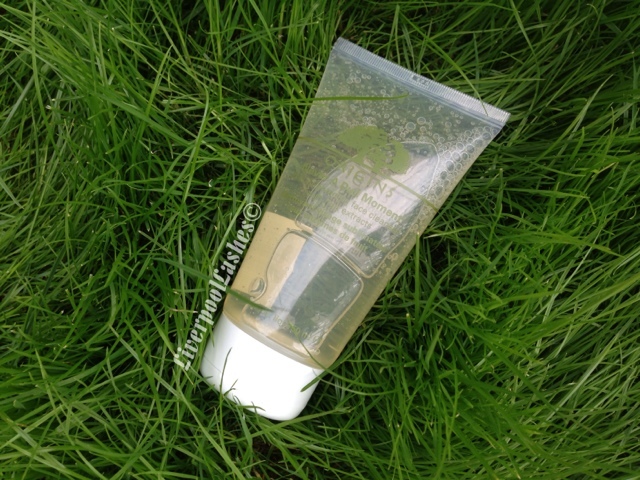 When my delivery arrived the first product I opened was the body cream and I was in love, the scent is absolutely stunning. It's time like this that I wish I could describe a scent so that you could almost smell it yourself but trust me when I say it's truly delightful! The texture is thicker than a typical lotion but I wouldn't say it was extremely thick like some products that seem like they just sit on the surface of the skin. I think this would be a lovely gift for someone else... mum, mother-in-law (if you like her!) sister, friend or just go ahead and treat yourself! Just like anyone else who's on You Tube either as a viewer or a creator, I have been sucked into the world of MAC. I would not even like to estimate how many pounds I've spent on their website. I had heard Amarixe on You Tube rave about their blush in 'Gingerly' and since I do normally love her recommendations I finally caved and bought it. 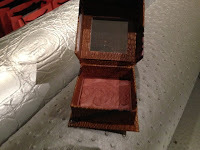 Gingerly is a brown toned blush with a hint of peach and a matte finish. 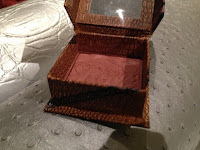 Perfect for a more natural look and because of the colour I find that it almost contours as well. The bottom line is... 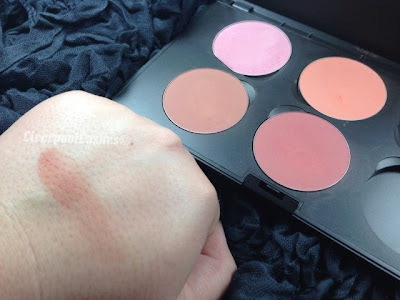 I adore this blush as it's perfect with most eyeshadow looks. 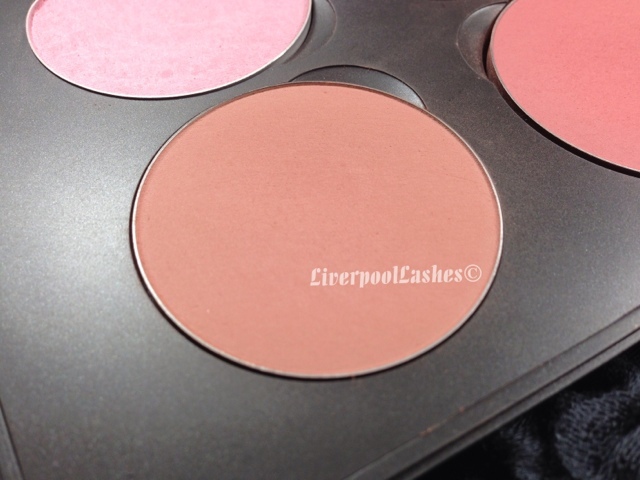 It compliments a neutral eye look but yet it also works well with a brighter eye as it's such a natural shade. I actually can't imagine not having this in my collection and when it's gone I'll definitely be repurchasing - no question about it. With my oily combination skin I've spent years fighting the shine but recently I've gotten into added a subtle highlight to the top of my cheeks. 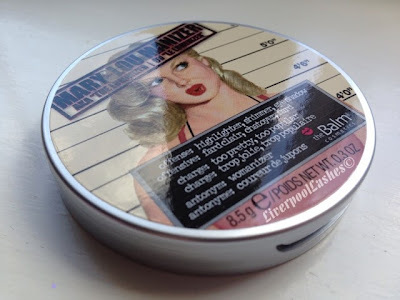 I've heard an awful lot of You Tubers rave about the theBalm Mary-Lou Manizer Luminizer so when I saw it on offer on FeelUnique.com I put my order in immediately! I love theBalm's packaging, it's always fun and kind of reminds me a lot of Soap & Glory with the style as well as the fun play on words with the names of each product. This highlighter is a champagne / gold sheen, I don't want to say 'shimmer' because to me that implies it's glittery when it's not. It's so finely milled that a little goes a really long way. I've actually heard it say that if theBalm did a mini size this would be great, this version is going to last forever! I really like the tone of the colour it gives, providing you don't go overboard with the initial application (it's easily done as it's so fine that a lot will stick to your brush) and build it up, the light just catches it nicely adding dimension to your face. The bottom line is... I love this highlighter. 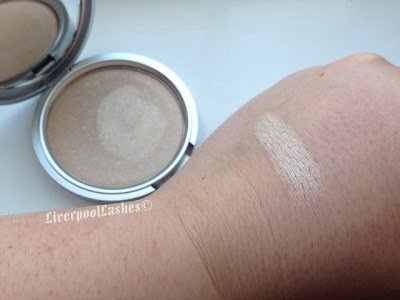 It's everything I was after, it adds a stunning glow wherever you apply it to and will even double up as a gorgeous eyeshadow. I highly recommend it! As a newbie nail technician I was always told that nail biters would be your hardest client and to reserve such appointments for when you have more experience. Obviously if you have a booking you can't necessarily help who turns up but I mean to perhaps not practise on a nail biters nails while you're still getting to grips with the skill. I was contacted by a lovely girl that I did the nails of on Friday who had a friend wanting acrylics but wasn't sure if it was possible due to her nail biting. I gave her the official answer which is "I'm trained to be able to customise nails to fit any person." Of course this is within reason, if there is nothing to adhere to then that's that out! Either way I was up for the challenge! Lianne wanted them to not stand out alot (like a glitter tip) and went for the tradition pink and white French tips. In general the eponychium (which is the skin surrounding the nail) tends to be overgrown in nail biters and pretty tough so my first job was to push this back so that I had a maximum amount of area for the acrylic formula to adhere to. 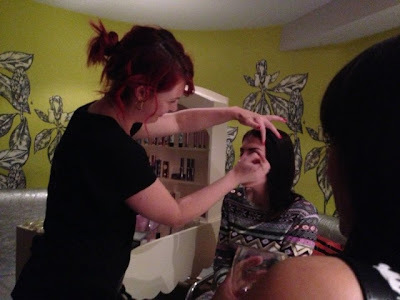 Next I used the NSI Radiant White to sculpt my smile line further down than where the her natural nail finished. To cover over the gap from where the natural nail stops and the new false smile line starts, you will always need to use a masking powder. I prefer to not use the NSI masque range straight out the pot and have developed a mix of 50% Purely Pink Masque and 50% Radiant Pink. Together these colours give enough coverage but also the illusion of a milky pink and less of a solid pink that the masque range offers. I have a big pot of this mixed and on hand at all times! Once her nails were all filed and cleaned up, I added a little Konad design on the ring fingers and NSI Glaze N Go to keep them super shiny for her. I watched her stare at her nails for ages in utter amazement. That was the best feeling as I knew she felt good looking at them after being seeming to be a little embarrassed when she first arrived. 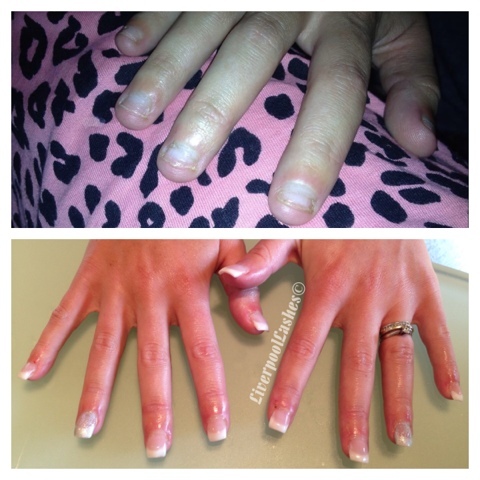 I did explain to her that it was best to keep them short as it will cause less strain on her natural nails. Hopefully if she looks after them, in a few weeks her nail will have grown out underneath. I think then she will be even more pleased and encouraged to kick the nibbling habit! As a You Tuber myself, when you watch other peoples favourite videos and they're always mentioning the same certain products, I take it that this person really thinks it's worth shouting about. 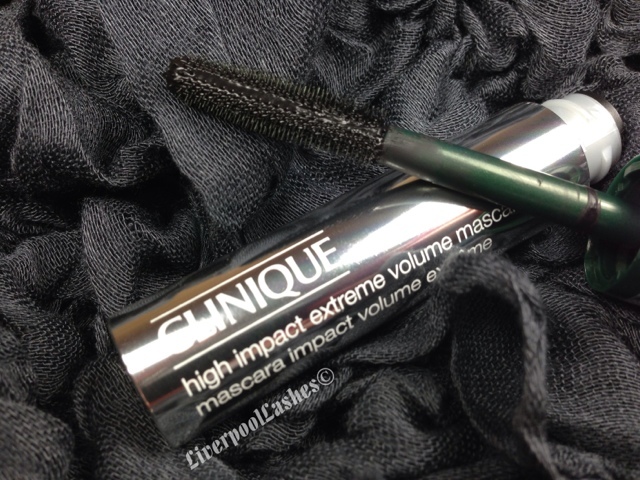 Kate from gh0stparties constantly mentions the Clinique High Impact Extreme Mascara and how brilliant it was. 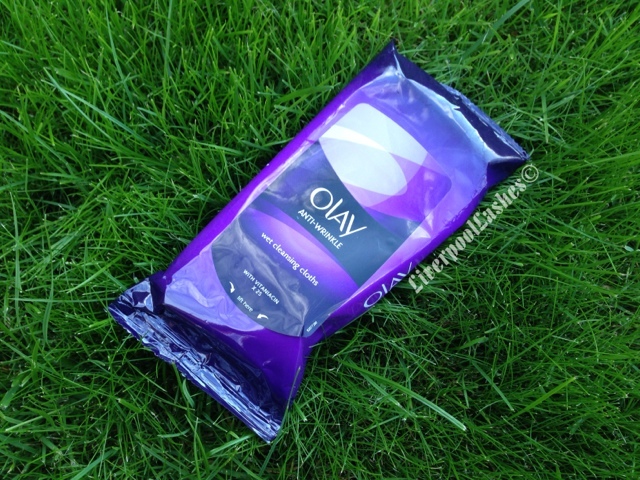 I was intrigued because it's not a product that I've heard raved about but then on the other hand, I've heard of plenty of raved about products that when I've tried myself have not been worth the hype whatsoever. I finally made a note of the mascara she raved of because so far, her recommendations have been spot on and I really value her opinion, particularly for skincare. The bottom line is... I highly recommend it. I'd go as far as to say it could even rival my Benefit Bad Gal Lash which I've loved for at least five years, even wearing it on my wedding day. 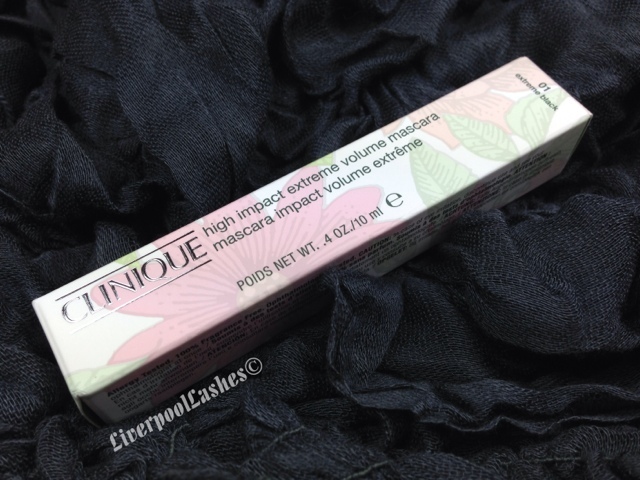 I really think it's a wonderful product and seems to be everything you'd want in a mascara. I can now see what Kate was raving about when she spoke about this hidden little treasure! For pretty much two years or more I've been obsessed with eyeshadows. It all started with eyelashes (hence the username) but then it went on from there. I love that you can dress up your eyes if you want to or add a little subtle something and a fun lip. I love the million different colour combinations, the shapes you create, everything. If you're a regular eyeshadow wearer then the chances are you'll need a little something to help it last longer and if you have oily eyelids, to help them not crease too. 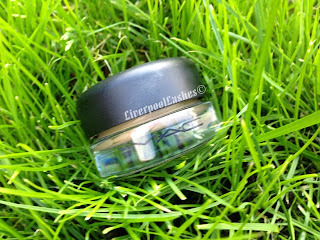 A while ago I went Paint Pot crazy and ordered MAC's Paint Pot in 'Bare Study.' 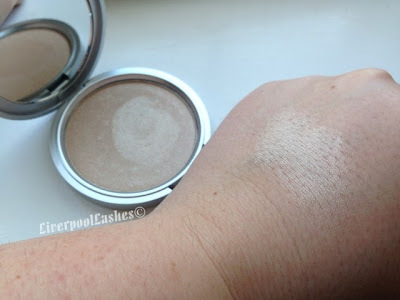 This is a pale, champagne shades cream shadow. 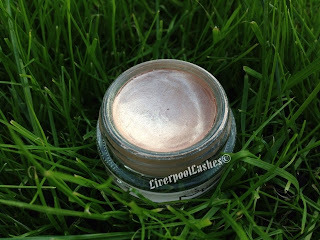 "A highly pigmented eye colour that goes on creamy but dries to an intense, vibrant finish." Well I'm afraid I have to disagree with this one MAC. My Paint Pot is not creamy, the colour is weak and borderline watery looking. I bought this Paint Pot at the same time I bought Painterly (which has it's own review posted on the 13th August 2013) so it's clearly nothing to do with the age of it. I feel like I'm missing something with this one, I'd heard people say that they just wear it alone for a quick look but I wouldn't want to wear the wishy-washy (technical term) colour on my lids. I absolutely hate giving a negative review on a product that seem to be so well loved by others. 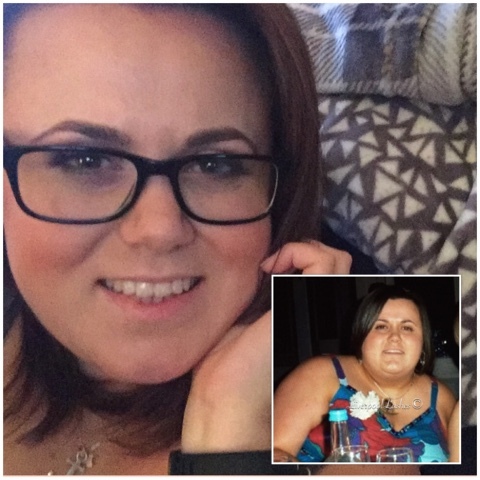 I imagine angry Bare Study fans crossing me off their Christmas card list but it was only when talking to Leanne (Obsessive Cosmetics Disorder Blog) and she mentioned having the same issues, that I decided to speak out! The bottom line is... I want to love it, I really do. I adore Painterly which, as my review says, I'll never be without. 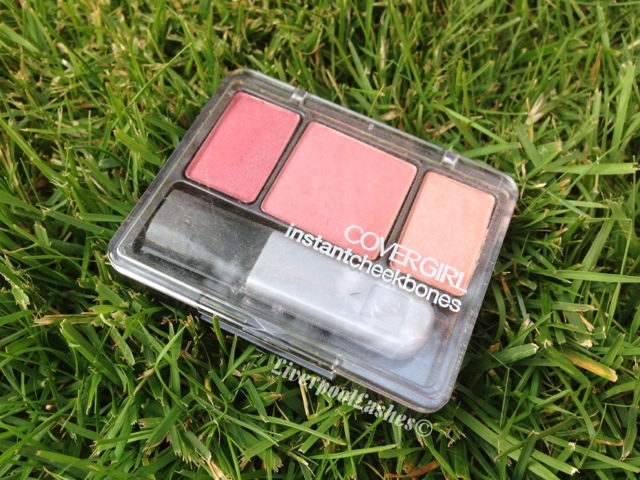 It has a creamy, butter-like texture that glides onto the skin and actually offers coverage if you just wanted to wear it alone. Perhaps if I didn't have Painterly and know how that is I'd like it but since I know how good a Paint Pot should be, I've clearly been utterly spoilt. I will continue to use it to see if my mind is changed but for the length of time I've had it so far I'm going to guess this isn't going to happen. Anyone that knows me knows that I love scents, lets call it a bit of an obsessive in fact. When I was little my Nanna used to keep empty perfume bottles for me. Now that I think of that I'm not sure why she did that but I'm guessing it was because I used to sniff the empty bottle? I'm really not sure. 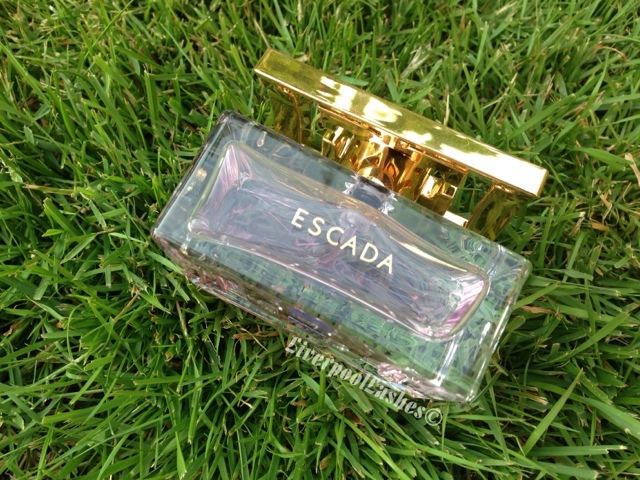 I was around at my friend's house once day last summer, I happen to start having a rummage through her perfume collection when I came across Escada 'Especially Escada' Eau De Parfum and took an instant like to it. 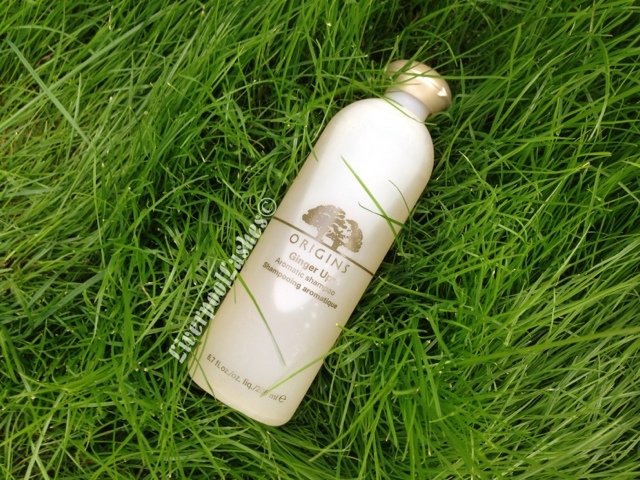 My friend is very sophisticated, her clothes, her make up, everything is immaculate - this fragrance matches that. I did have a cheeky squirt of it and every time I visited I'd ask her where 'my perfume' was so that I could get my fix until my husband finally bought me it for Christmas! "The fragrance opens with an intense and sparkling top note of pear that combines with the exotic and musky notes of Ambrette seeds. Together they create a burst of sparkling freshness and the idyllic introduction to the all-important heart accord.At the heart of the fragrance lies the beautifully special scent of a fresh and dewy rose combined with a watery facet that captures the aroma of rose petals.In addition to the delicate rose notes, Ylang Ylang emanates a soft, floral and intensely feminine appeal. The luxurious combination of rose and Ylang radiate a fresh and natural aura of positivity; the uplifting ingredients synonymous with joy and happiness.Light musky notes to support the delicate floral bouquet complete the scent adding a subtle touch of femininity." The bottom line is... This perfume is stunning. I feel like it would suit alot of women's tastes from most age groups. Its light, feminine and sophisticated and would make a perfect present for you or someone else. 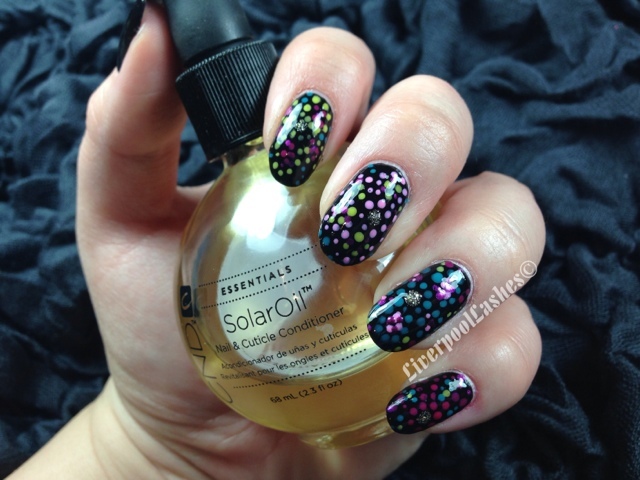 This is definitely one for you to check out! 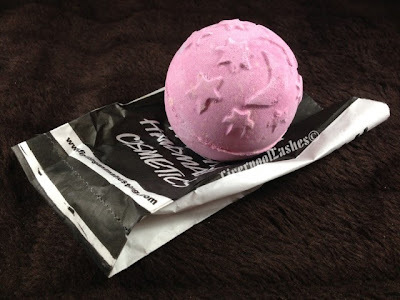 Having recently struggled to sleep I went into the Lush store in search for natural ways to help me relax before bed. 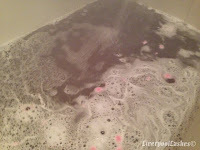 I decided to try out their Twilight Bath Bomb which contains lavender oil, in the hope that it would help. 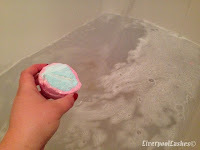 Now call me tight but this bath bomb is pretty big compared to others so in my mind I figured I that I chop it in two and get two uses out of it. Hacking it in half wasn't too bad, it was a bit crumbly but easily done. Inside it reminded me of those massive gobstoppers you used to get when you were a child and you'd lick them for three hundred hours until they were tiny. Chucking one half into the running water I sat and watched it fizzle. 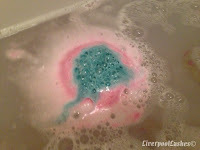 Once it was done and there were nothing left of the bath bomb, I realised that the water didn't have much colour to it, you could barely smell it, so it wasn't really going to do the trick as a product to help you sleep. Begrudgingly I threw in the other half, accepting that my tight-wad ways hadn't worked out this time and watched it fizz away. The teal sort of colour the centre turns into the water is lovely, my bath did get a lot darker with the full bath bomb in. 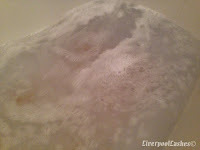 Little bits of glitter appeared which did make my bath look like the moonlit sky with a few stars. The fragrance was definitely a lot stronger too and extremely relaxing. "Twilight dissolves to create a growing sunset that gradually gets darker until you are finally left with the glimmer of stars." 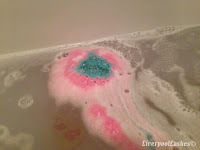 I suspect that if I hadn't chopped it in half and allowed it to do what it was supposed to do, the pink would have fizzed away first giving me a pink sunset coloured water and then the blue would have kicked in to make the bath darker and darker until it got to the little bit of glitter right in the centre. Massive fail on that part and I'll happily admit to it. 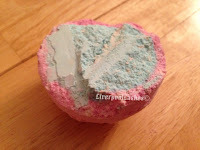 I have always enjoyed the way your skin feels from the Lush bath bombs, they really make you feel moisturised and silky. 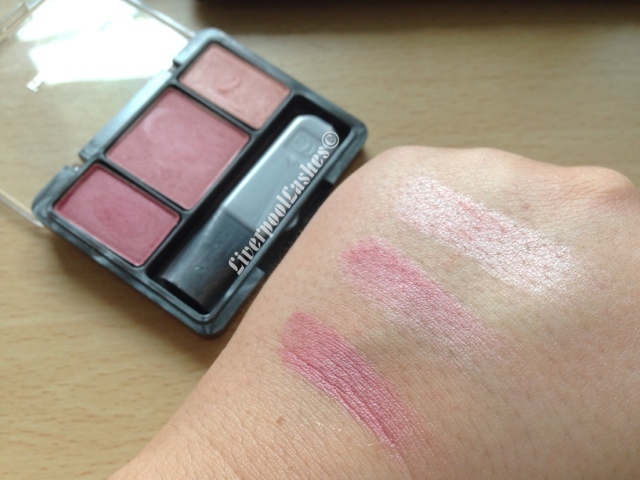 I like this trio of blushes as it's pretty much got all you need, a peachy highlighter, a light baby pink and a plum. 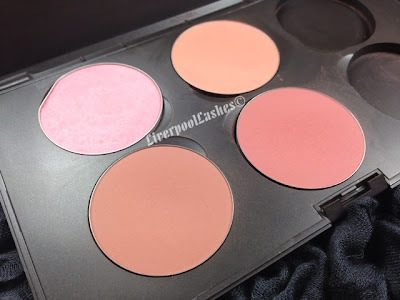 Officially it's meant to be a highlighter, blush and a contour, although I naturally associate 'contouring' with brown shades to mimic a shadow. The bottom line is... I think this palette was around $5 - $10. 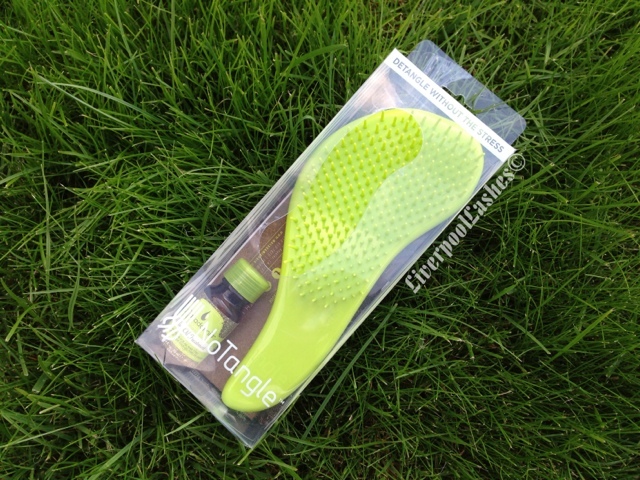 The price is great and I really like the product. Sometimes I will just use one colour on it's own. It's versatile and if you have a chance to pick this one up, I definitely think you should! 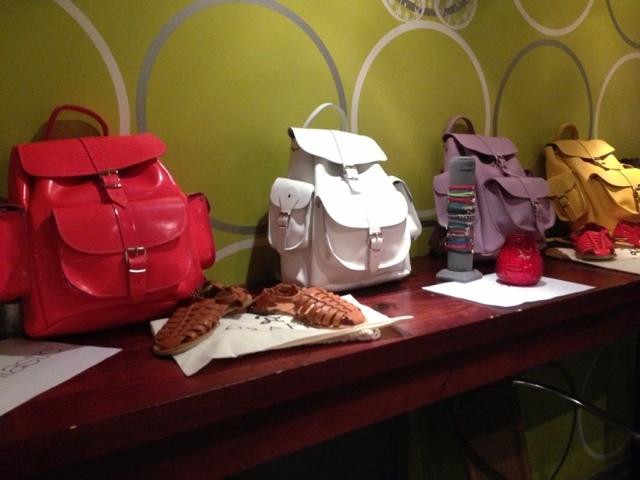 Last night I attended the Mid Summer Meet hosted by Look Fantastic, All Sole and My Bag at Walrus in the Northern Quarter. Apart from the shaky hands as I climbed in my car, I was ridiculously excited as this was my first event. I prepared for the best part of a week, dyed my hair, did a moisture mask on my face every day so that when I had a spray tan it was even and dithered about what to wear. I changed my nails for the occasion so I figured I'd include those in this post. I decided to go back to something I wore last year and loved so much. It's rare for me to go back to anything, in fact I think this is the only time I've had my nails exactly the same. 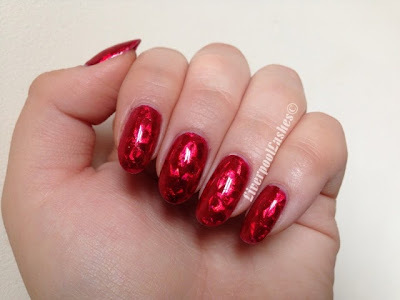 I did red shellac with foils using Hollywood underneath. 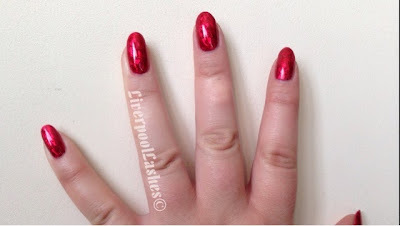 I do have a 'how to apply foils with shellac video' if you do want to watch that. So... onto the event. I met Laura from BeautyLoversNotes.com near the venue and when we arrived we were guided downstairs to the private event area and treated to a drink of your choice. 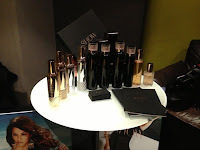 Benefit Cosmetics, Moroccan Oil, L'Oreal Professional, Evo, Burts Bees and Nails Inc were all there with their own small display of products and representatives ready to give you consultations and advice for each brand. 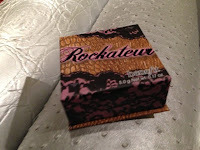 So the first stop for us was the Benefit display where there was a lovely lady showing us the new Benefit Boxed Powder in 'Rockateur' that's due to be launched next month. She was also doing make up for anyone that wanted it but typically I'd arrived with it all done and my signature lashes. 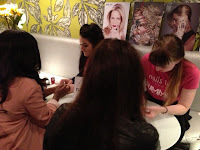 Nails Inc were doing peoples nails. I wouldn't have minded being treated to having my nails done but as I had my Shellac on then that was that out of the question too but never mind! 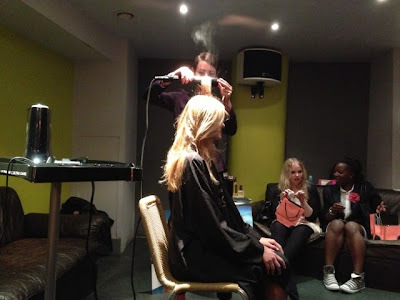 L'Oreal demonstrated their new Professionnel Steampod which is designed to have a continuous steam pressure combined with its anodised ceramic plates meaning it straightens and smooths the hair and therefore leaves it looking glossy and silky smooth. 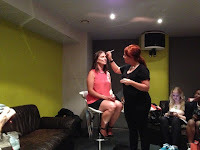 Benefit demonstrated how to contour and highlight. Interestingly the lady mixed 50% Boing Concealer with 50% High Beam and applied under the eyes. 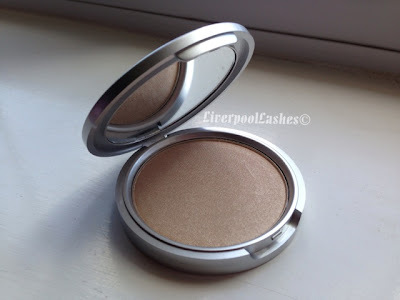 I'm actually thinking of mixing my High Beam with my usual under eye concealer and test this one out for myself! 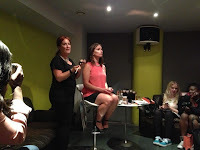 Moroccan Oil showed us their amazing products. 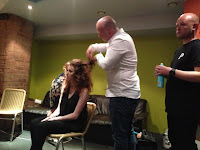 We watched their model have hair so voluminised it was unbelievable. 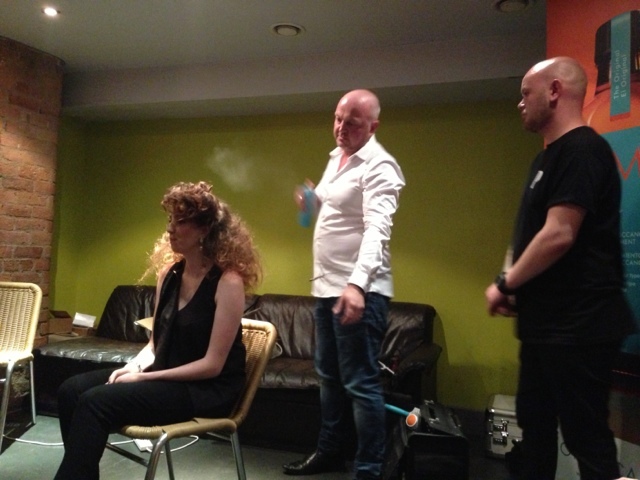 He seemed to add so much product to it but then he allowed us to stand up and feel it and amazingly it just felt soft. 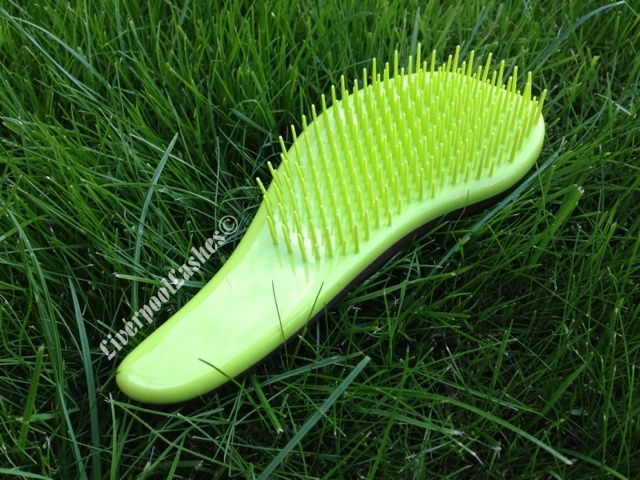 Then he just ran a brush through it effortlessly and there were just smooth soft waves. The last demonstration was by Evo which I really enjoyed. 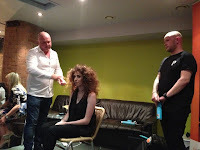 It featured a model who had platinum blonde hair at 2pm that afternoon. 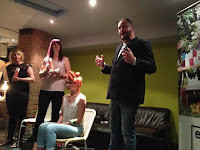 They applied Evo Fabuloso Colour Intensifying Conditioner in Copper to her hair and this conditioner tints the hair giving the results in only three minutes! 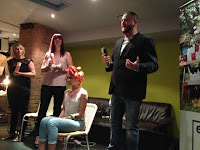 There are seven colours in the line intended for lighter and darker hair tones. I think the best part for me is that he said that the colour lasts for around 12 washes, once its washed your hair will return to the exact colour it was originally which is brilliant for blondes. I'd be very keen to try this out for myself. They also showcased their other products in the range which all have amazingly fun and edgy names. He showed a fine mist that defied gravity by spraying some into the air and blowing a hair dryer, when it stopped you could see the particles rising where as normally they would obviously fall. I was delighted to hear of a raffle, splitting the above prizes into three to raise money for Alder Hey Hospital which was brilliant, I hope they raised a good amount for such a brilliant cause. 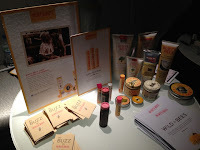 Above is a selection of the displays from Burt's Bees, My Bag, All Sole and Show. 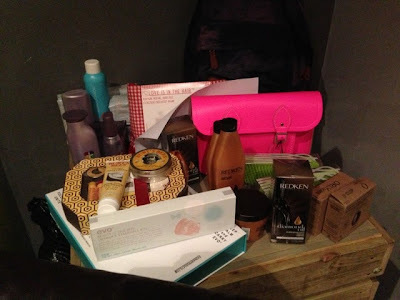 I had a throughly enjoyable evening and was delighted on my way home with a wonderful goody bag that I intend on fully testing and reviewing for you all. Everyone was lovely and welcoming, full of knowledge and I soaked up every bit like a sponge. I'd love to attend something simular in future and would hope to be able to speak to some more bloggers. To the ladies that made it happen, thank you. I know theres alot of buzz about it and rightly so, you did a good job. The below paragraph is intended for my husband who will hopefully see this and get the hint. 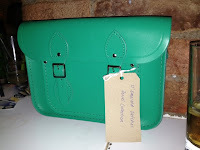 Darling this is the Cambridge Satchel Company 11 Inch Leather Satchel in Emerald that was at the event, along with various other amazing colours. I've spied this bag for such a long time and it would complete me as a person if I could have it in my life. I'd say this is a perfect gift idea for our anniversary, christmas, birthday or any other date on the calendar. LOVE IT.